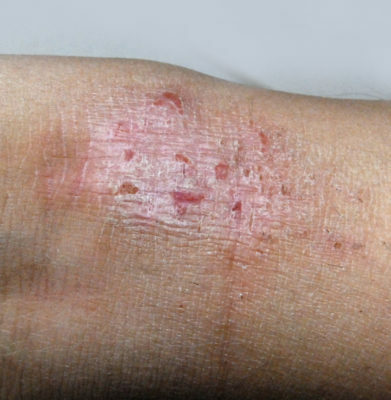 Eczema and psoriasis are two very common — and very frustrating! — skin conditions. While both cause redness, patchy dry skin, and irritation, they’re actually completely different conditions, and so are their treatment options. 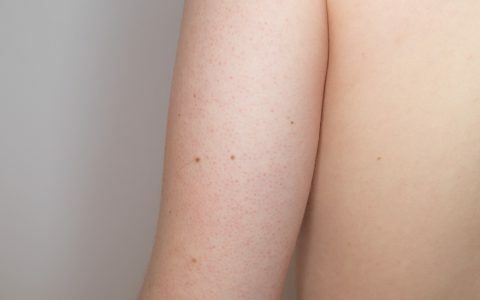 Let’s take a look at the major differences between these two skin issues to better understand them — and their solutions. Also referred to as atopic dermatitis, eczema is caused by inflammation in the skin that produces red, itchy, dry patches which may crack and bleed. This inflamed skin often develops on the face or scalp, but is also common on larger areas of the body. There’s no official cause of eczema and it can develop at any age, but it’s thought to be genetic and may be triggered by diet, stress, or environmental factors such as a cold, dry climate. The visible dry patches, irritation, and discomfort that eczema causes can be frustrating and painful, especially because the condition has no known cure. There are, however, a number of ways to soothe eczema-prone skin. Warm baths followed by gentle colloidal oatmeal moisturizers can be incredibly helpful, as well as avoiding known triggers. This condition also causes dry, thick, itchy red patches of skin, but psoriasis patches are caused by skin cells that multiply at up to 10 times the normal rate. These extra cells get pushed to the surface, layering on top of one another in thick patches called plaques. Appearing on the body with a silver, scaly feel, plaques can cause some serious pain and discomfort. Like eczema, the exact cause of psoriasis is unknown, but recent research suggests it could be caused by immune system abnormalities, streptococcal infection, or stress. 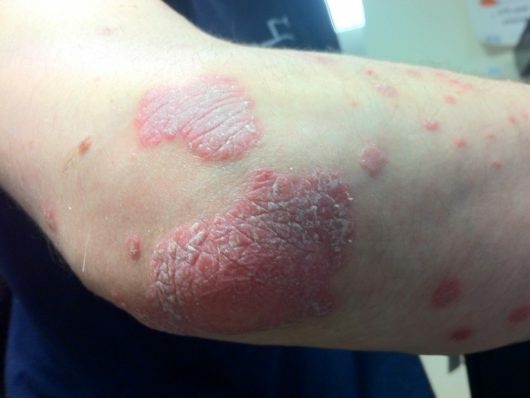 Unfortunately, there is no known cure for psoriasis either, but symptoms can be managed with topical medications and treatments containing salicylic acid, which is proven to break down plaques. It’s best to consult a dermatologist when treating psoriasis. Think you may be suffering from one of these conditions? Contact your dermatologist — they’re there to help when the symptoms of these conditions become unmanageable. Trying to determine which one I have — eczema or psoriasis. Mine has little ‘boils’ and when I scratch them they break and that seems to relive the itching. Then it’s dry and scaly. It is on my hands. Have taken my 5 year old grandson to a dermatologist a few times and all they do is put him on steroid creams and antihistamines, not good when they are so young. Wish we had answers to help him. We use coconut oil in his bath and on his body to try and control it. Not fun for such a young person, has had pretty much since birth. I have psoriasis on the tops and bottom of my feet!!! No treatment I have done has worked!!! Its simple and good explanation of Eczema and Psoriasis, common dermatological conditions effecting quality of life and causing social stigma. Sometimes patients have to adopt occupational changes, especially in case of Eczema. I, at my clinical research, found that abstaining alcohol and avoiding stress resulted in sufficient improvement for both of these conditions. Thanks for explaining that eczema can develop on the face in red, itchy patches. I have something like that behind my left ear and in my scalp, but I wasn’t sure if it was eczema or psoriasis. Based on your information, I think I know what I can tell the doctor I have when I go to a dermatology clinic. So I have fairly bad eczema/psoriasis. Several Dermatologists have looked at my effected areas, and not one could say which it is. The areas are on my right elbow/arm, not in the elbow crease however. And almost completely over my right leg, starting at the knee. It acts almost exactly like Psoriasis, however via biopsy tests say it’s eczema. Yet it isn’t in the places eczema usually is. I’ve had to use a very intense steriod cream, but that’s the only thing that even knocks it. However, the steriod cream is very harsh on my skin and thins it. Any ideas to alternatives? I have little bump/blisters they are itchy and red all over my hands they said it’s dermatitis eczema I just got it this year. I do have my hands in gloves since I’m a EMT. I used gold bond eczema relief it helps a little but do suggest something better. Thank you. My son had psoriasis on his head in his hair any helpful tips?? Tried teatree shampoos but it’s so bad it’s sticking to his hair now horribly!! Hello! Thanks for the information and the tips! I have eczema since two years ago. For me it has been really difficult to control it because of my type of skin, it is really sensitive when it comes to eczema treatments. The best treatment that I’ve tried is foderma, it has helped me a lot! I’d appreciate if you have more products reviews or tips! thanks!